On DJ Kan-i: Black blazer by Divya Rajvir; gold chain, ring, both from Al’s tattoo studio. Both in Mumbai. Cap, T-shirt, pants and sneakers, all DJ Kan-i’s own. On Major C: black jacket, by Pawan Sachdeva, New Delhi. Printed T-shirt, from Diesel; black pants, from Tommy Hilfiger; gold rings, bracelet, all from Al’s tattoo studio. All in Mumbai. Watch, sneakers, both Major C’s own. On DJ Proof: leather jacket, from Gas; black pants, from Tommy Hilfiger; gold bracelet, from Al’s tattoo studio. All in Mumbai. Printed T-shirt, gold chain, both DJ Proof’s own. On Dj Kave: black blazer, by Pratham and Gyanesh; mesh T-shirt, from Diesel; black and white checkered pants, from Tommy Hilfiger; gold chain, skull ring, both from Al’s tattoo studio. All in Mumbai. Watch, sneakers, both DJ Kave’s own. On Spindoctor: velvet jacket, from H&M; skull necklace, from Al’s tattoo studio. Both in Mumbai. Black T-shirt, pants, sunglasses, chain, watch and sneakers, all Spindoctor’s own. On DJ Sa: embroidered jacket, from H&M; printed T-shirt, from Quicksilver; gold skull ring, from Al’s tattoo studio. All in Mumbai. Pants, black chain and sneakers, all DJ Sa’s own. On Enkore: blazer with mesh detail, by Divya Rajvir; T-shirt, by Rajat Tangri; checkered pants, from Diesel Black Gold; gold cuff, from Al’s tattoo studio. All in Mumbai. Sneakers, Enkore’s own. It was December 4, 2016 when it hit me. After closely following the homegrown hip-hop movement for many years from within and afar, I watched one of the country’s most popular music festivals being closed by an entire lineup dedicated to the genre — an unprecedented event. To add to that, the expansiveness of the audience that gathered to watch, dance and scream along with the rappers and deejays was a pleasant surprise. When Tripura-based Borkung Hrangkhawl took the stage, things got exciting. Dynamic and unapologetic, he rapped with a vengeance about issues like racism and discrimination, leaving the crowd fired up. What followed was nothing short of magical. All-star after all-star, collaboration after collaboration, everyone present was treated to desi hip-hop in all its glory. From Delhi-based emcee Prabh Deep, slick producer Sez and Kurla star Naezy, to new-school deejay Proof, turntable pros DJ Kan-i and Spindoctor, veteran performers Enkore and Bobkat, and a double whammy of Indian-American star Raja Kumari and Bombay boy Divine, the NH7 Weekender team pulled no punches in their curation of class acts. This was a big night for artistes and fans of the genre alike, mainly because it had been a long time coming. India doesn’t naturally spring to mind for having a flourishing hip-hop scene. But if current drifts are anything to go by, we can safely say that what was once termed ‘underground’ has evolved into a major crusade. A large chunk of the credit can be given to the influx of new talent, led by a fresh breed of emcees, a number of whom are now signed to big music labels, collaborating with international artistes and performing at major venues. Far from the Honey Singh-esque sound that the general public might be familiar with, they embody a social consciousness and authenticity that is truly refreshing. “The tone has changed,” Tej Brar, head of artist management at Only Much Louder, tells me. “Earlier they were talking about bling, money, cars and fashion — it was aspirational. But what we’re hearing now are real stories.” Chandigarh-born Manmeet Kaur holds nothing back when rapping about her relationship with her parents, husband and music itself. Bengaluru-based Samir Rishu Mohanty aka Big Deal, is crowdfunding his debut EP and, on the first released track, talks about his mixed heritage and the identity struggle it created for him while growing up in Puri. “It’s the true essence of hip-hop,” Brar explains. “The stories are what the audiences find relatable and so they choose to support the artistes. They’re not faking it; they’re talking about their lives.” Another thing they’re doing is making a conscious move to rap in their vernacular. This means that despite tapping into the sounds and vibes of their western counterparts, they’re speaking for — and to — every desi, from millennial students and NRIs to street hawkers and Bollywood fanatics. MC Mawali raps in Marathi, Prabh Deep in Punjabi, Feyago in Bengali, MC Bijju in Kannada, and Naezy in Hindi, Marathi and Urdu, while MC Todfod is the country’s first Gujarati rapper. Crews like Slum Gods, Swadesi and Dopeadelicz cover all these languages as well as Tamil and Malayalam. “The homegrown circle struggled to find its identity for a while, but I feel it had to go through that to get where it is now, organically,” Mo Joshi, founder of independent label DADA and CMO of desihiphop.com, muses. “It’s getting stronger and I can gauge this by the quality of submissions we get each month. We have established artistes as well as kids as young as eight or nine sending in videos recorded on phones.” There are so many more names to digest, but they come with a lot of soul just waiting to be discovered. Plus, there are the veterans and entrepreneurs. The ones who keep the music alive in clubs and through pioneering ventures; those who’ve been in it for the long run…who’ve been making sure that ‘hip-hop ain’t dead’. DJ Uri has been a mainstay since 1987 — instrumental in both inspiring and mentoring a new generation of music makers, while spearheading dance nights that have made people fall in love with the genre. He’s also head of the deejay department at The True School of Music in Mumbai. Major C or DJ Chantz is another pillar of the community, especially for reggae lovers, with and apart from his Bombay Bassment mates Ruel Barretto, Levin Mendes and Bobkat. 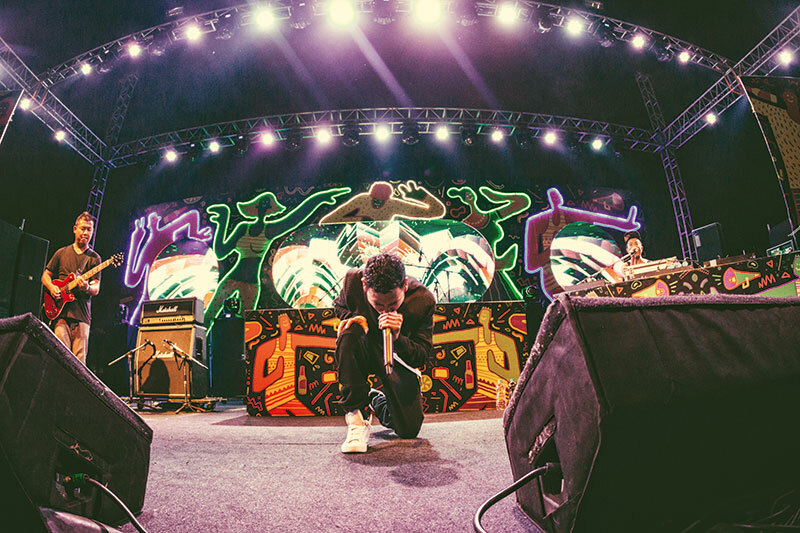 Together they are also the first Indian hip-hop act selected to play at the Glastonbury Music festival. Bobkat has also been responsible, along with DJ Ishani, for Mumbai’s famed Thursday hip-hop nights that have been drawing massive and extremely loyal crowds for years now. 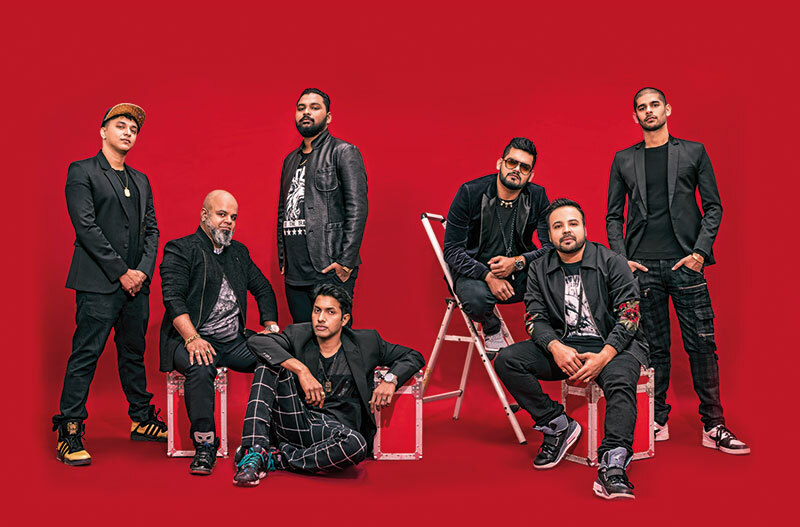 The Reggae Rajahs, too, have been a vital part of the revolution since 2009, as the first group to spread the love of Caribbean music throughout the country. What’s more, each of the group’s members has had their own solo influence in and outside India. Trap and old-school forerunner DJ Sa has been on the scene for more than a decade, picking up the title of India’s best hip-hop deejay at a couple of major award shows and leading Blue Frog’s Uncensored nights for more than two years. With his guidance, Vinayak Pasula or DJ Proof has risen to the challenge of bringing the new-school sound to the masses. One of the first to introduce video turntablism to the country, Hyderabad’s DJ Kan-i has been spinning for over 15 years, while DJ Kave, known for being the official deejay to maestro AR Rahman during the Jai Ho concert series, is also the founder of The Skratchlab — one of the country’s finest deejay academies. Spindoctor Sanjay Meriya teaches the art of turntablism at Audioqube, The True School of Music and Party Map DJ Academy when he’s not busy performing around the globe and producer Sajeel Kapoor is the man behind the slick beats that have been the foundation of the top rap releases in the last few years. (When you hear ‘Sez on the beat’ during a track, you can credit it to him.) And taking it a step further, pioneering rapper Ankur Johar, known to most as Enkore, founded Voice of Tha People (VOTP) along with Bob. Through podcasts, a website, articles and events, VOTP educated and entertained, pushing artists into the limelight they deserved. It’s been a towering journey already, and hip-hop in India still has a long way to go, but its trailblazers are demonstrating a level of artistry and resourcefulness, a ‘hustle’, which is unstoppable. “I honestly believe that we haven’t even witnessed a tenth of what’s to come,” Joshi reiterates. Festival curators have been pushing the cause as well, and don’t plan on stopping any time soon. Flashing back to the night that inspired this essay, I remember observing the shock, awe and pure inspiration that blanketed a group that comprised most of the artistes already mentioned — when international legend DJ Premier walked on stage to play the closing set. This month, you’ll probably see it happen yet again, when Grammy award-winning hit maker Macklemore takes over the main stage at VH1 Supersonic. India and its breed of dynamos are most definitely on the radar of global bigwigs now…and they’re geared for great things. So the next time you wonder where Indian hip-hop is going, remember the riposte: all the way up.